I thought with this modest post I'd give links to two websites of artists and craftspeople working with the same color: Blue. More specifically, they are dyeing with the chemical compound Indigotin. Indigotin is found chiefly in two plants: Woad (Isatis tinctoria) and Indigo (Indigofera tinctoria)- the second part of both plant names tips us off to their use. Indigo apparently has thirty times more blue potential in it than woad, which explains in part why it has never exactly gone out of use. Woad however, was the dye used mostly in Europe until cheap exports of Indigo from India (via England) ruined the local business. This wasn't entirely a bad thing though- there are writings from the time expressing the effect woad had on the land- it robs soil of much of its nutrition, creating a wasteland in its wake and requiring fresh soil every ten years or so to keep the plants viable. Currently, it is naturalized in the US and very much a nuisance weed in certain areas. The first, Bleu de Lectoure is a business run by a couple in France creating all sorts of products using woad as the coloring agent. Pastels, house paints and clothing are just some of their creations. 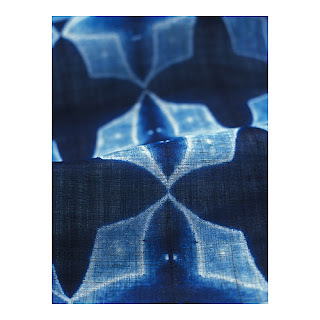 The second, is the work of Rowland Ricketts and his wife Chinami: They've farmed and processed indigo in the past and use it in their fiber art presently. Their work expresses beauty and lightness in a very contemporary style. Either way, I'm sure you'll agree that in skilled hands these plants contribute something wonderful.